For “Autobiography” McGregor decoded his DNA as a starting point to create a dynamic piece with an electronic soundtrack by musician Jlin. In this piece, ten dancers will take you on a journey to the self, trough life experience, creating choreographic portraits. In the new piece “The Sea Within“, choreographer and dancer Lisbeth Gruwez abandons precision and embraces chaos. With musician Maarten Van Cauwenberghe she founded the collective Voetvolk. And together they bring a magical contemporary ritual in which the “we” dissolves into the unity of the “I”. 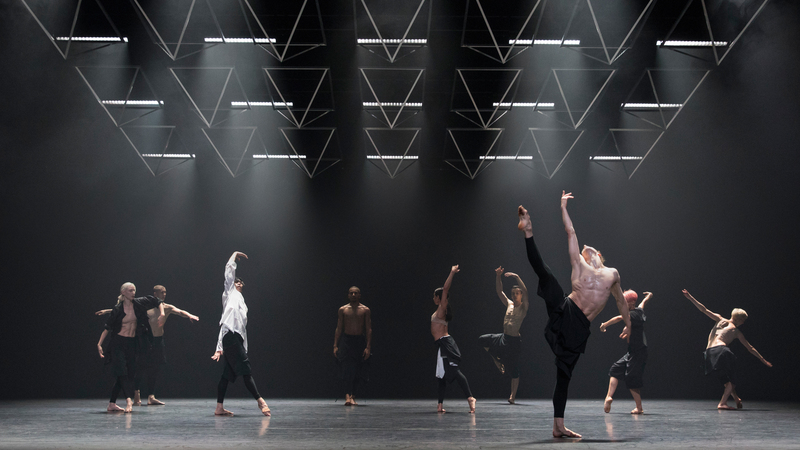 The Ballet de l’Opéra de Lyon invites you to see, hear and experience a new reinterpretation of Beethoven’s “Great Fugue” with every choreography. “Trois Grandes Fugues” represents the perfect and complex combination of classical music and contemporary dance. In “Pixel“, eleven dancers will use their bodies to guide the projections that rule in a digital universe. Käfig combines hip-hop, contemporary dance, and circus. With the help of digital artists Adrien Mondot and Claire Bardainne, video art and dance become one creating a hypnotic landscape. Through the representation of the most intimate moments, the Norwegian choreographer Alan Lucien Øyen explores the fragility of the complexity and beauty of being human. Joining forces with Pina Bausch’s Tanztheater Wuppertal they created “Neues Stück II“, a piece between dance and theatre under the artistic direction of Adolphe Binder. The work of Spanish painter Botero, the 80’s Jane Fonda and concepts like excellence and success inspired this one-woman show,“R. OSA”. Claudia Marsicano is that virtuous woman whose performance will challenge the view of how we perceive others. The Italian choreographer Silvia Gribaudi not only uses the body for expression but also as a reminder of its social implications. Inspired by the French visionary Loïe Fuller, Ola Maciejewska takes this style to the sublime in “Bombyx Mori“. Three dancers rapped in infinite long black fabric that merges with their own bodies. This piece explores the power of primitive and contradictory forces and the thin limit between human and non-human. “Service No.5” is the fifth part of the ” Choreographic Services ” series. The Berlin choreographer, Adam Linder creates a divergent performance dominated by obscure and theatrical tendencies. You can enter or leave the 5h performance at any time. Driven by the corruption scandals in his own country, Brazil, Bruno Beltrão directs ten dancers who will confront this issues. With “Inoah” Beltrão wants to raise questions regarding the impact of the events and ideologies that shape us. All of this through a compelling choreography that mixes breakdance and hip-hop with contemporary dance. “Chatsworth” is one of the Durban townships where Indian immigrants were isolated during apartheid. Famous Berlin-based choreographer Constanza Macras has created a piece that talks about the impact of traditions, multiculturalism, transformation, and resilience. All of that through the merge between traditional Indian dance and theater, with a contemporary approach. Unfortunately, there is no trailer for this piece because is not ready yet. But we wanted to show you another example of the work of this talented choreographer. Das kulturelle Leben in Berlin ist auf höchstem Niveau. Jeden Tag passiert etwas. Ich liebe es!